While there is no documentary evidence, legend has it that the origins of coffee are firmly planted in the Ethiopian region of Kaffa around 850 A.D. This is plausible because the coffee plant has a tendency to grow spontaneously in this region like nowhere else in the world. 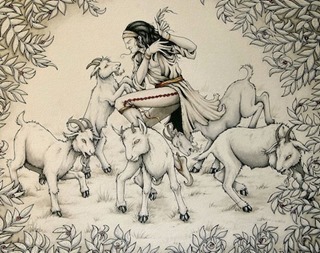 The story goes that a local shepherd by the name of Kaldi observed his goats dancing around and full of energy after feeding on a shrub with dark green leaves and brightly coloured red cherries. Curious, Kaldi decided to try some of the cherries himself, and found that they had the same effect on him. Before coffee became the favoured household morning drink, it was consumed in other ways by the early discoverers of the fruit. In its raw form, coffee is a fruit similar in appearance to cherries. Upon ripening it turns bright red, with the coffee seeds located in the middle of the fruit. According to some Ethiopian records Sudanese and Ethiopian traders travelling to Yemen chewed on the berries to provide strength and stamina during the gruelling trek. Inhabitants of Kaffa and ethnic groups like the Oromo combined butter with ground coffee beans and created a protein rich food they consumed for sustenance. At one stage the fermented pulp of the fruit was used to make a drink similar to wine. Upon discovering the unique properties of coffee cherries, Kaldi shared his knowledge with the Monks in a nearby monastery at Lake Tana, the source of the River Blue Nile. Immediately the monks termed the fruit work of the devil, and threw the sample berries Kaldi had brought with him, into the fire. Quickly the monastery was filled with the pleasing aroma of the roasting beans. The beans were hurriedly recovered from the fire and placed in hot water to preserve their goodness. The monks eventually consumed the drink only to discover that it helped to keep them awake during their long nightly devotions hence, the beans came to be regarded as being divine. Thus began a tradition of roasting coffee beans over open fires, in stoves and a host of other ways. Even though coffee roasting has undergone major improvements since the days of the monks, the underlying principal is still the same. Natural coffee beans are treated to heat at temperatures of 355 to 415 degrees Fahrenheit. During the heating, most of the bean’s water content is lost and the bean increases in size due to the expansion of the gases with the bean. Eventually popping noise, similar to that of popcorn is heard as the gases try to escape, signalling that the bean has reached its initial roasting point. Arabic documents going as far back as 900 AD describe a drink called ‘buna’ that was consumed in Ethiopia. This is the very first allusion to roasted, ground, brewed coffee. Later the Mufti of Aden paid visited Ethiopia in 1454 and observed his countrymen consuming coffee. He was very taken by the drink particularly because it cured him of some ailment. His approval of the drink made it popular in Yemen, and from here it was eventually introduce in Mecca, Saudi Arabia. Coffee transformed into a social trendy drink in Mecca where the original coffee houses were established by the name of Kaveh Kanes. Originally these coffee houses were in reality places of religious gatherings, but they quickly became places where gossip was exchanged, along with story-telling and singing. As the popularity of coffee increased, it became a topic of heated arguments among practicing Muslims of the time. Kahwah, the Arabic word for coffee is also one of the many words for wine. This is because the cherry husk was separated from the seed and fermented to produce fairly potent liquor and the Quran did allow the use intoxicating beverages. However, Muslims favouring coffee claimed that it was a stimulant and not an intoxicant. When the governor of Mecca saw people drinking coffee in a mosque as they prayed, he became furious and ordered all coffee houses closed. The Mufti (Muslim religious authority) spoke in favour of the drink. The issue was resolved when Sultan of Cairo stepped in and admonished the governor for banning a drink that was very popular in Cairo, without bothering to consult a higher authority. In this way the Muslim world was the forbearer of the European coffee houses. Muslim traders introduced coffee to Sri Lanka, known as Ceylon at the time, in 1505. All coffee beans traded in the Far East were rendered infertile by perching and boiling the seeds. By doing this the Muslims were able to corner the coffee crop market. Not a single coffee plant existed outside the Arabian and African continents until the 1600’s. The fertile coffee beans were smuggled to India by Baba Budan, a pilgrim to Mecca in seventeenth century. This act eventually led to a more competitive coffee trade. Venetian traders brought coffee to Europe in 1615 and once more it was the centre of controversy in Italy. Some clerics recommended it should be excommunicated because it was the Devil’s drink. Pope Clement VIII felt otherwise, since he loved the drink so much, he announced that it should be baptized “to make it a true Christian drink”. The first coffee house opened its doors in Venice in 1683, while Café Florian in Piazza San Marco is the oldest coffee house in Europe. In the middle of the 1600’s coffee was brought to North America by the Dutch traders. Initially it was introduced in an area called New Amsterdam (later renamed New York), where it quickly gained popularity, however tea was still the drink of choice. It wasn’t until 1773, when colonists protesting against the hefty tea taxes imposed by King George, dumped a whole shipment of tea into the sea and converted into a nation of coffee drinkers. As the demand for coffee grew, the need to cultivate the plant outside of Arabia also became apparent. Towards the end of the seventeenth century, the Dutch successfully obtained some seedlings but were unsuccessful in cultivating them in India. They succeeded in establishing thriving plants on the island of Java in Indonesia. Earlier in 1714, The Mayor of Amsterdam had gifted a coffee plant to King Louis XIV of France, who ordered it to be planted in the Royal Botanical Garden. Gabriel de Clieu, a daring naval officer managed with great difficulty to acquire a seedling from the King’s garden and transport it to Martinique. After planting, the seedling thrived here and was the source of more than 18 million trees that sprouted on the island over the next half a century. These initial trees are credited with being the stock from which all of the coffee trees in South America and the Caribbean originated. Today, the top coffee producers can be found in Brazil and other South American countries, but also in and around Asia, many tasty types of coffee are being grown and harvested.